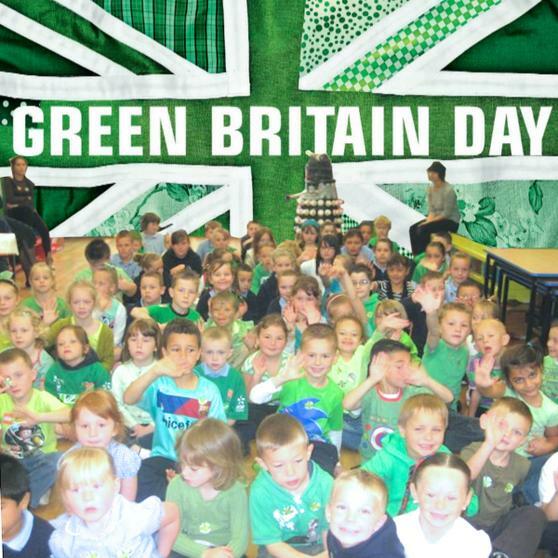 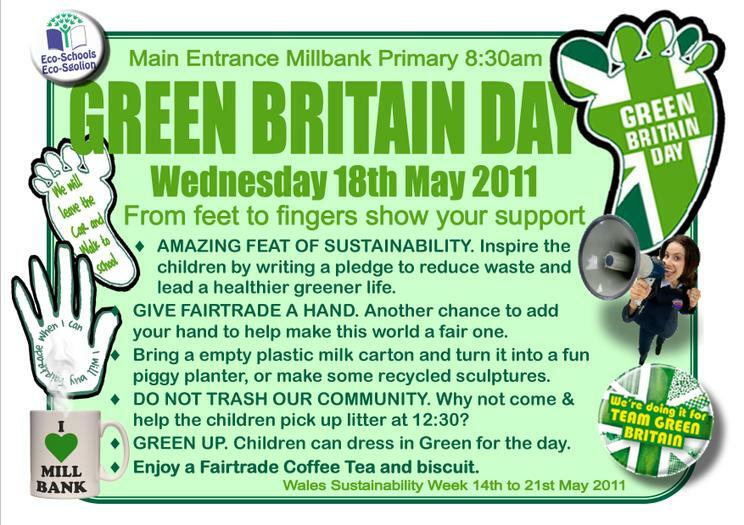 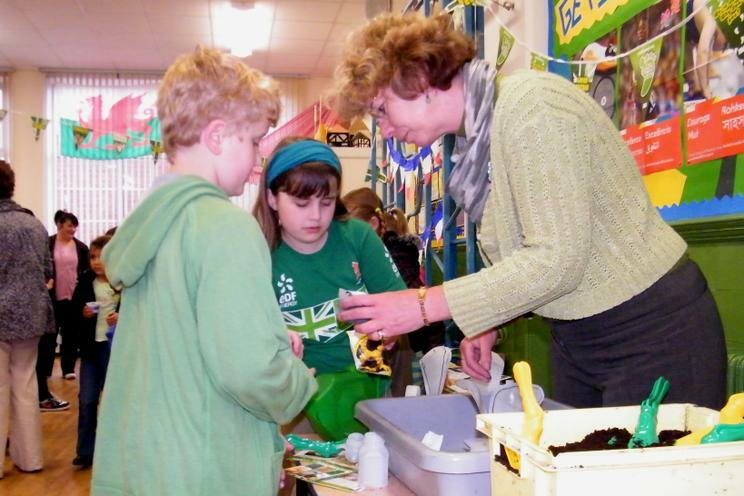 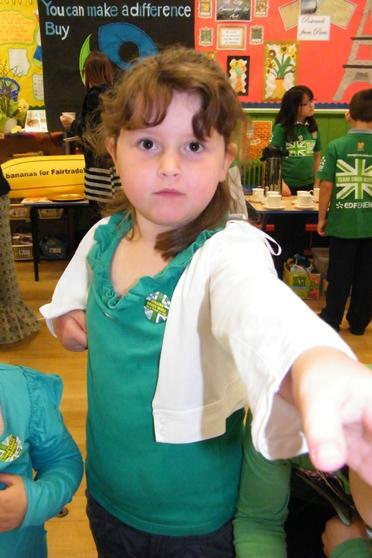 Green Britain Day is another important date in which we try and get the whole community involved in being that little bit more environmentally sustainable. 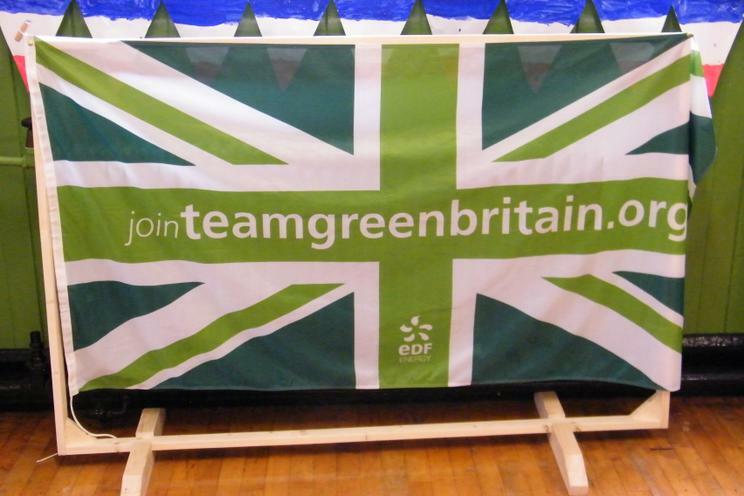 Britain is often referred to as the 'dirty man of Europe' when it comes to the environment. 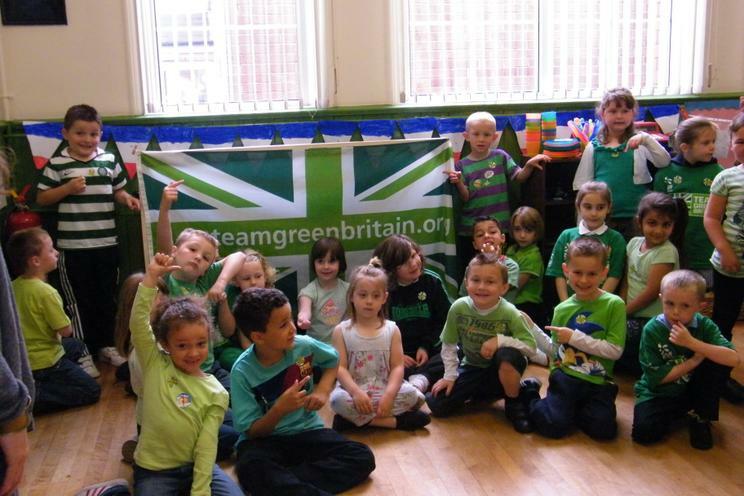 This is a chance to celebrate all the positive things we do ahead of the Olympics next year. 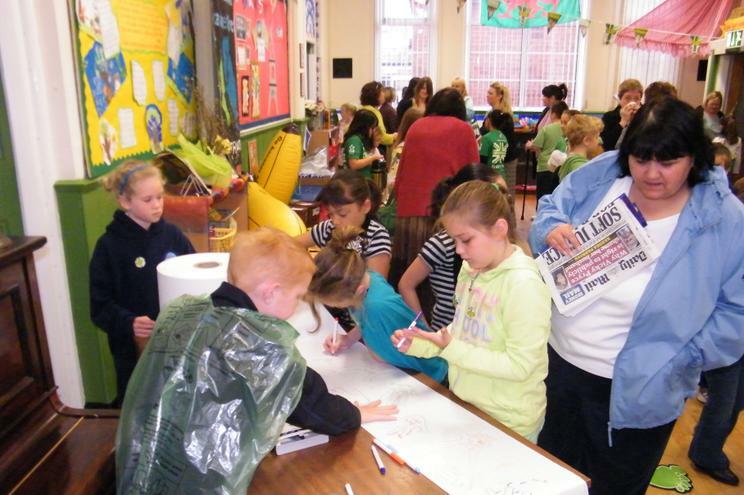 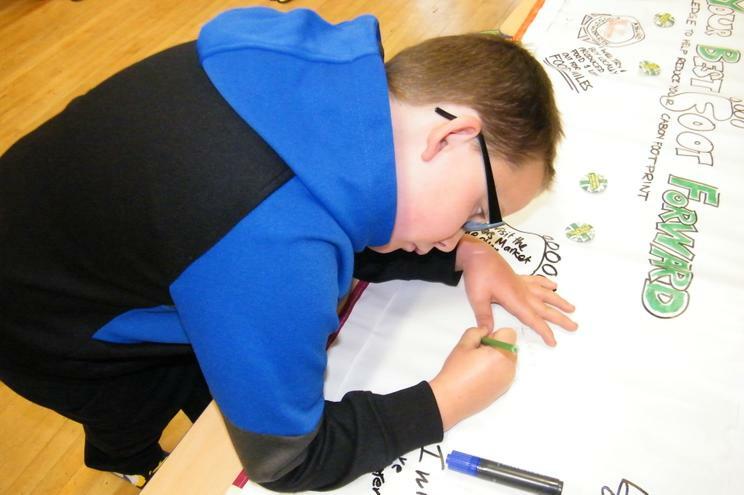 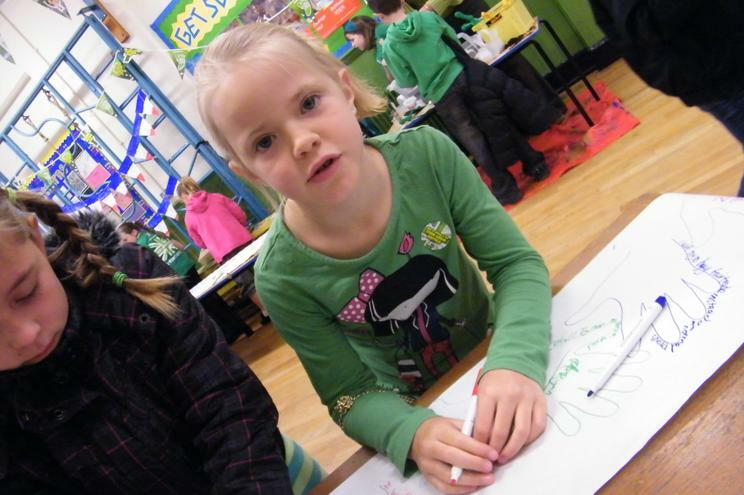 Parents, governors and friends were invited in early to have a FairTrade cup of tea or coffee with local Welsh milk and make a pledge on the banner about how they could be more environmentally sustainable in the coming year. 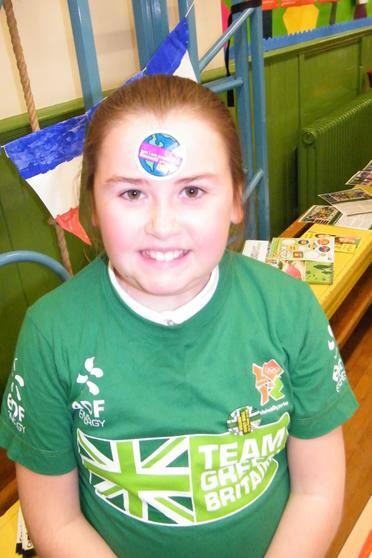 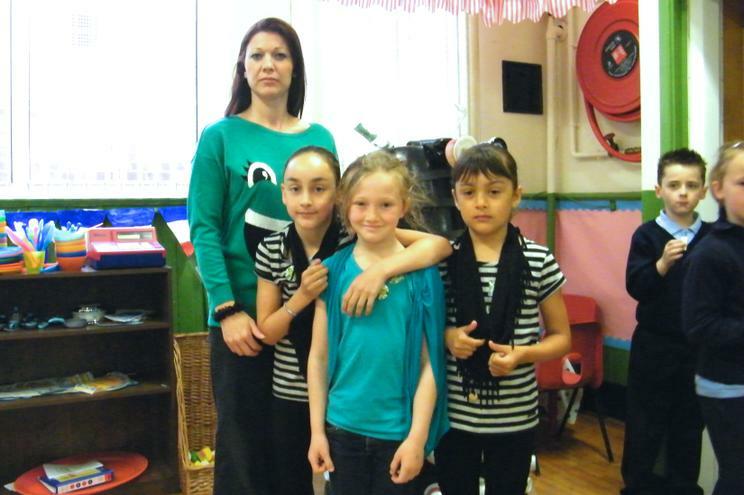 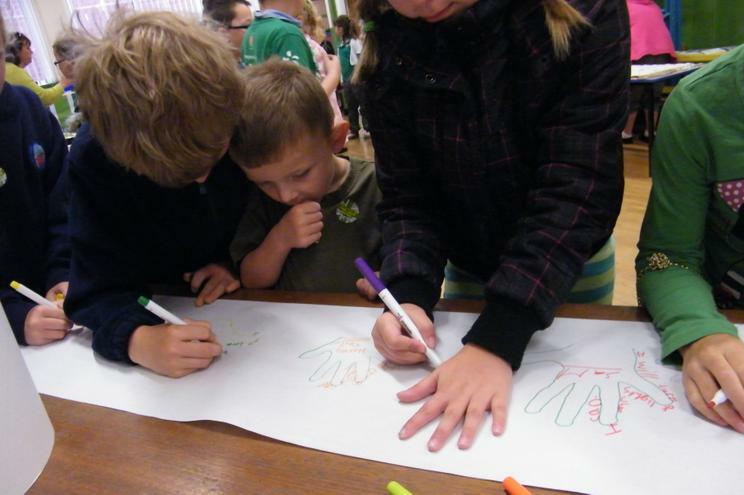 The main purpose of course was to get people to think about the issue of our Carbon Footprints and how we can reduce them. 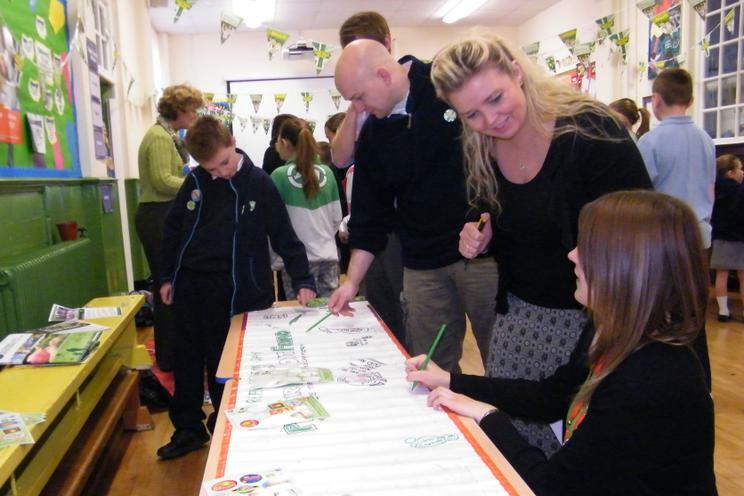 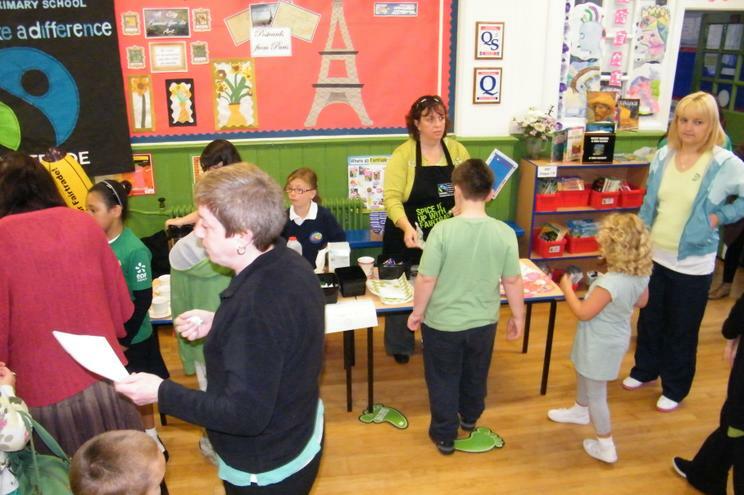 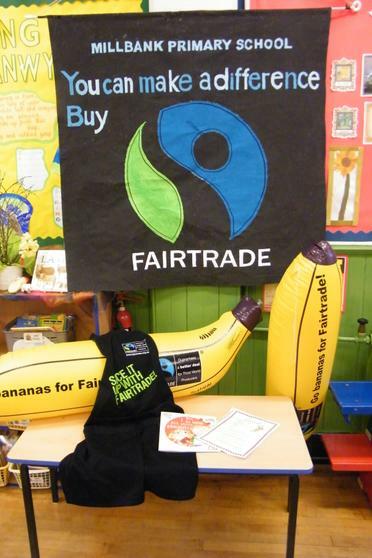 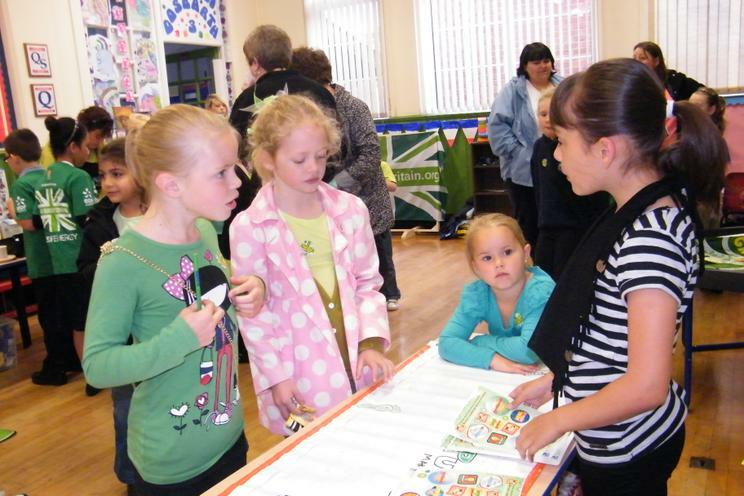 There was another opportunity for parents to add their handprint to the Fairtrade Banner too! 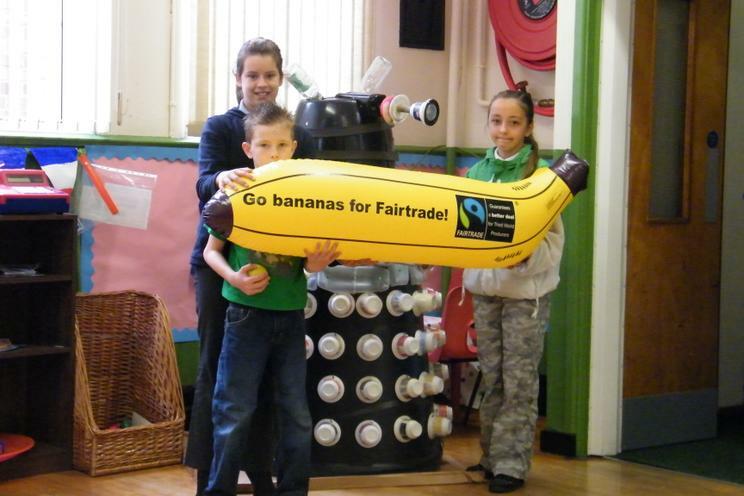 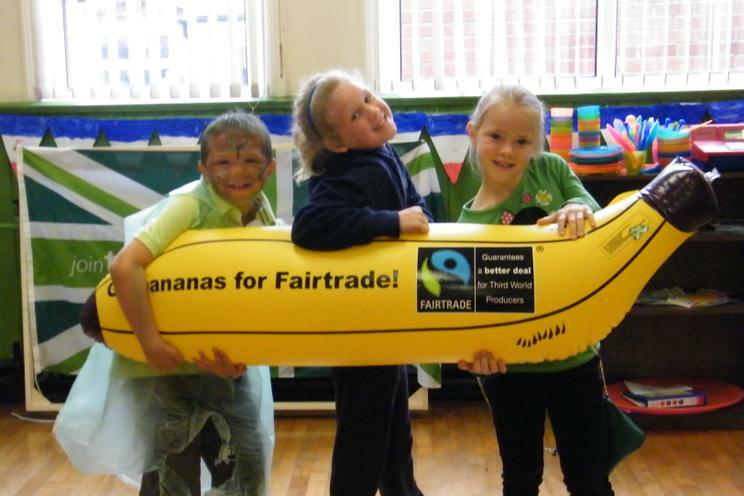 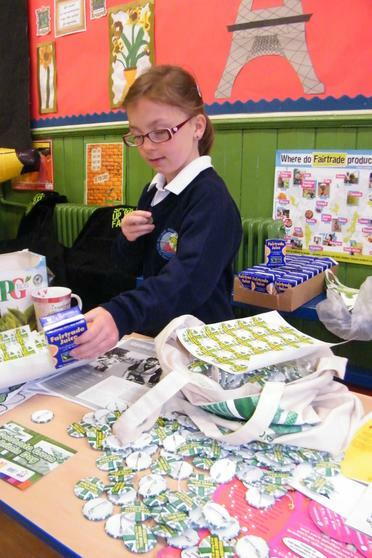 A big part of FairTrade is about sustainability and whilst we are just as keen on local produce and the Red Tractor Mark it is an important part of the school ethos. 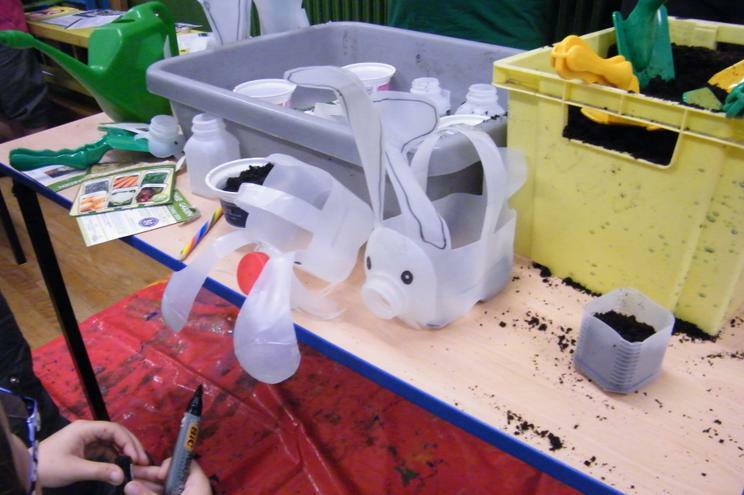 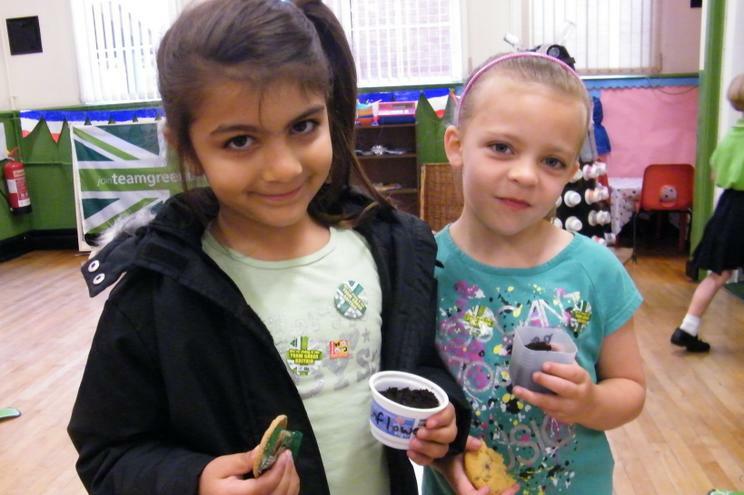 Many of the children planted seeds as part of the grow your own food theme in recycled plastic containers. 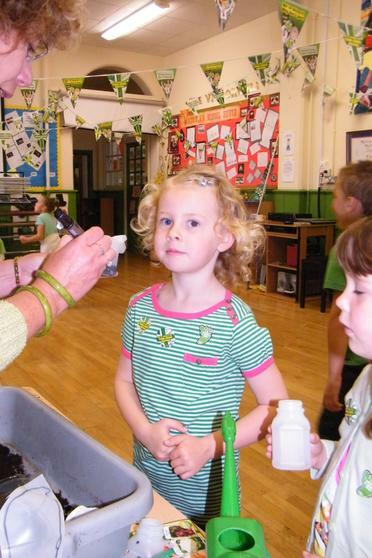 Some of the seeds were sunflowers but it was something nice and simple that the children liked doing. 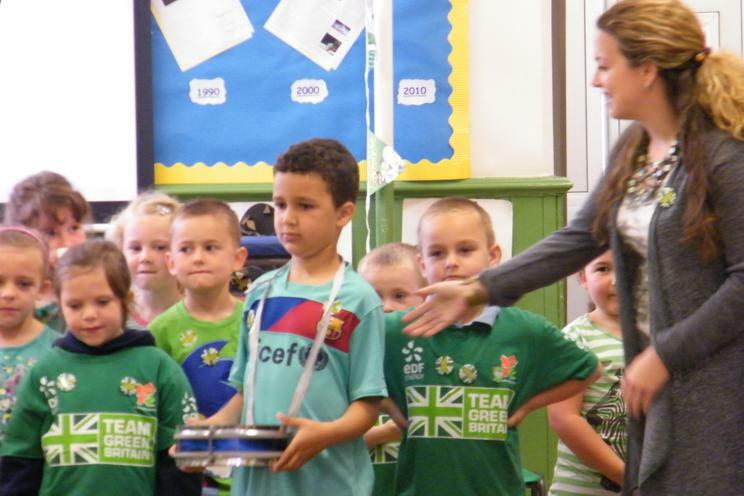 They decorated their pots too. 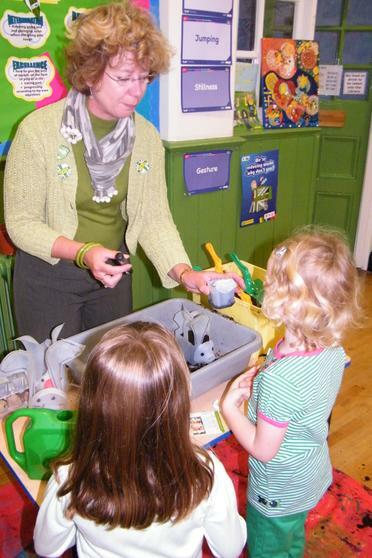 The bunny pots are great fun to make and can be as complicated or as easy as you time/skill allows. 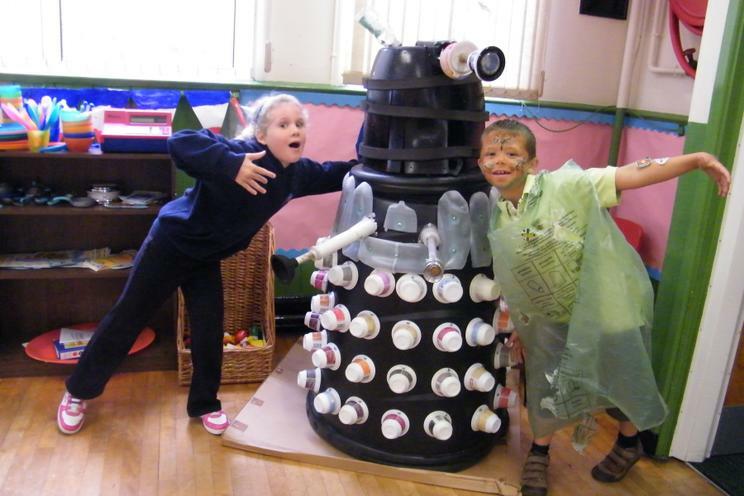 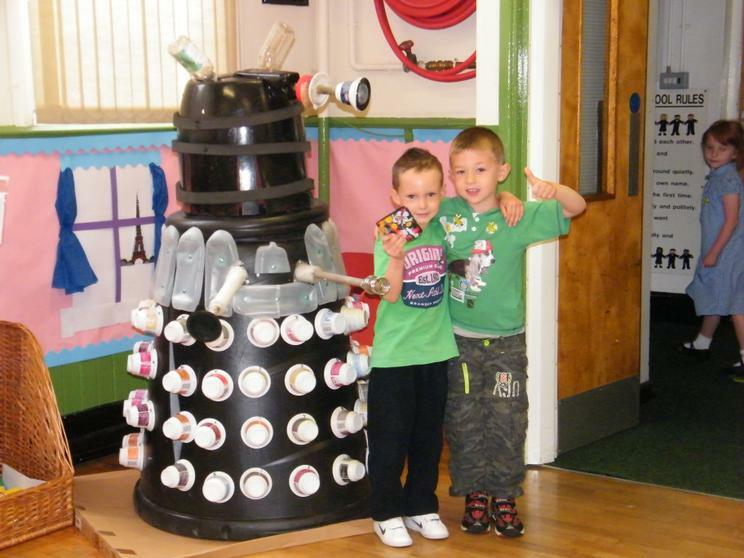 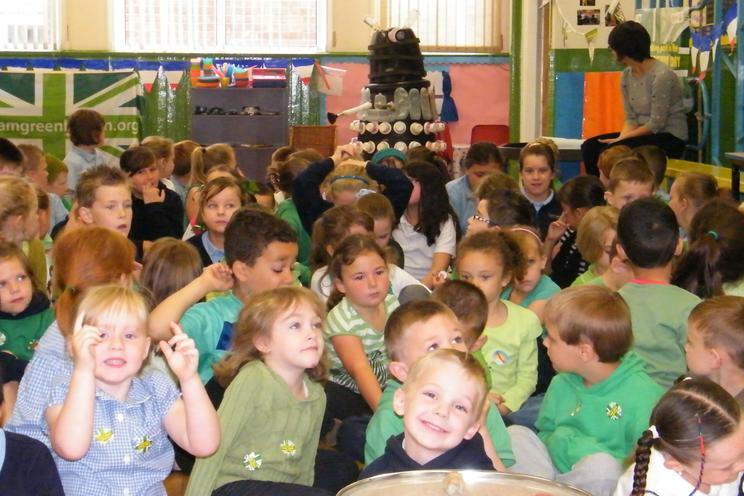 Of course we also tried to encourage composting with our recycled Dalek Compost bin. 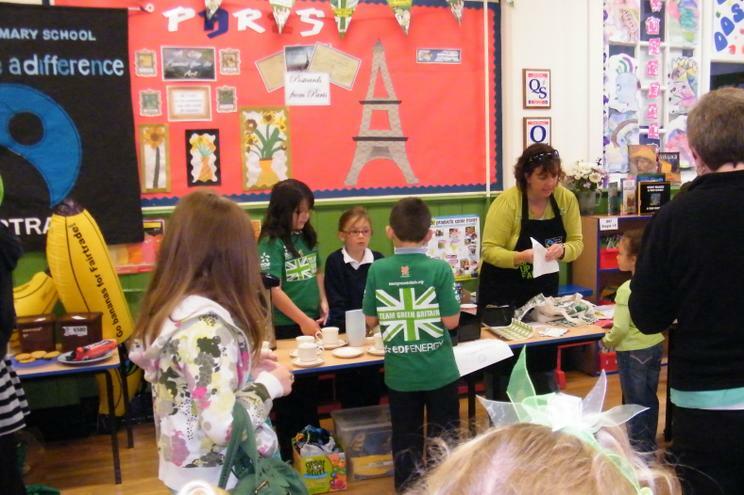 There was a definite carnival atmosphere with all the bunting (recycled from the last few years of course) badges and the fact that everyone was dressed in green for the day. 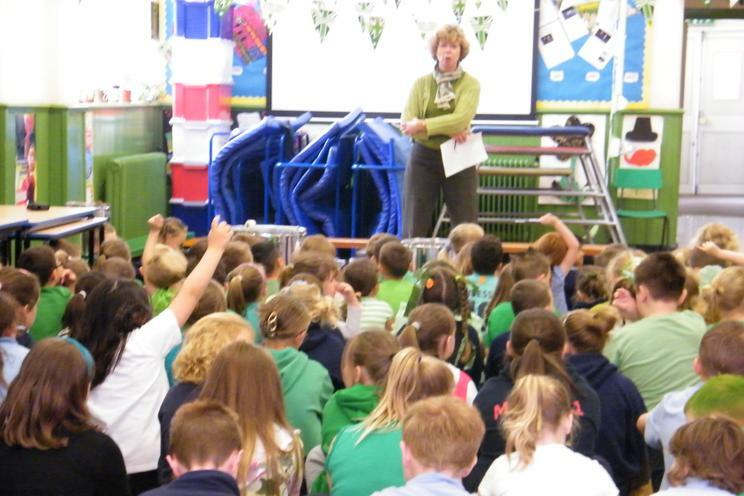 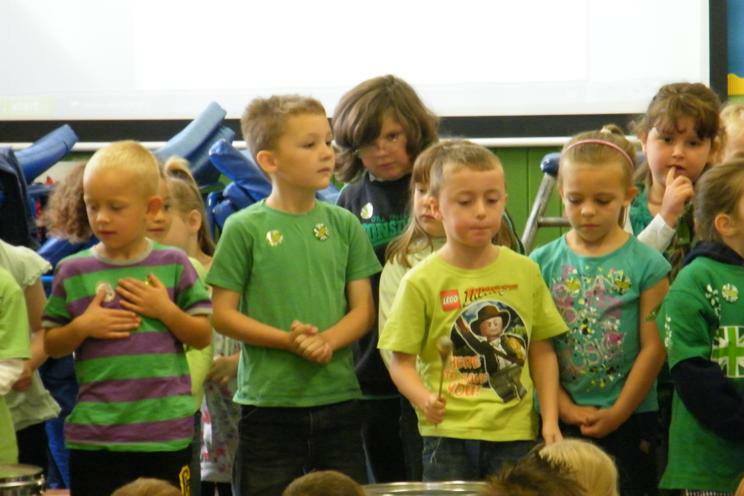 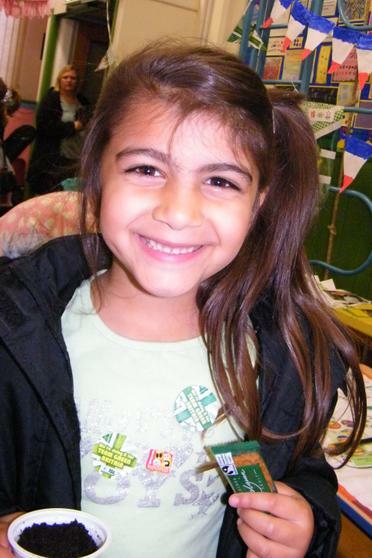 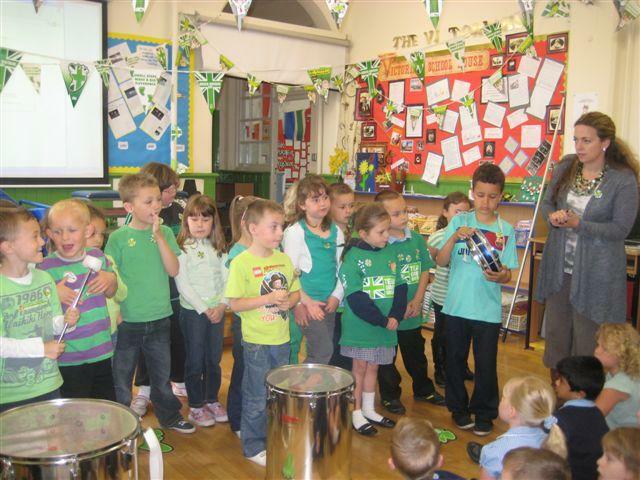 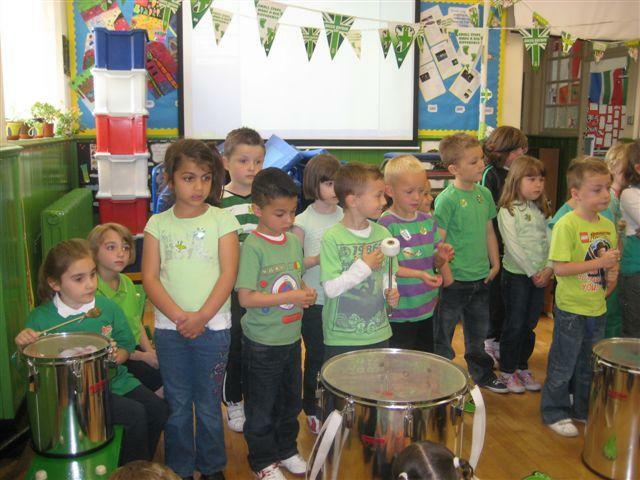 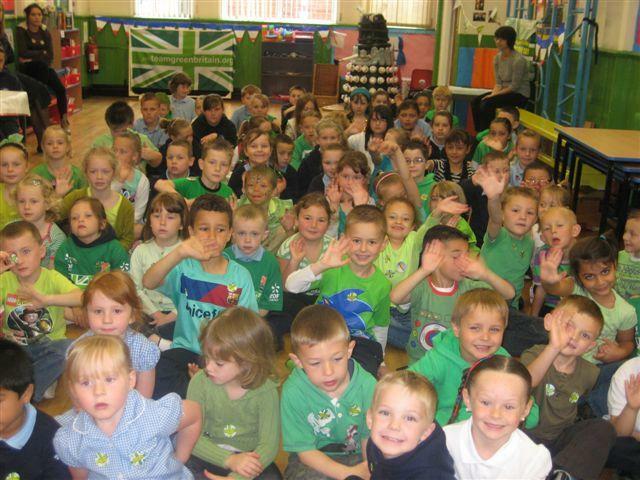 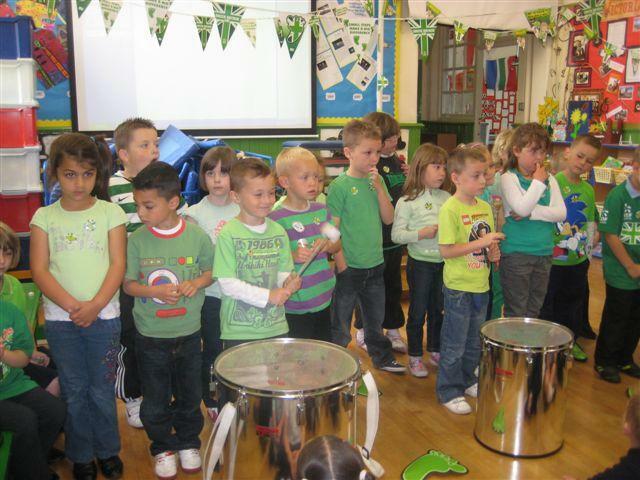 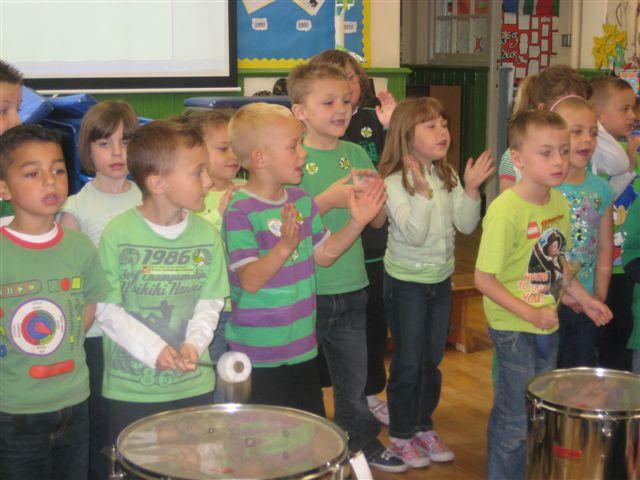 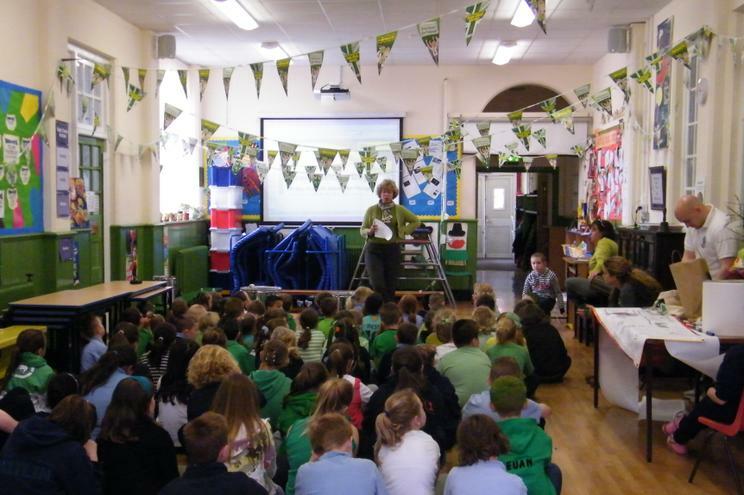 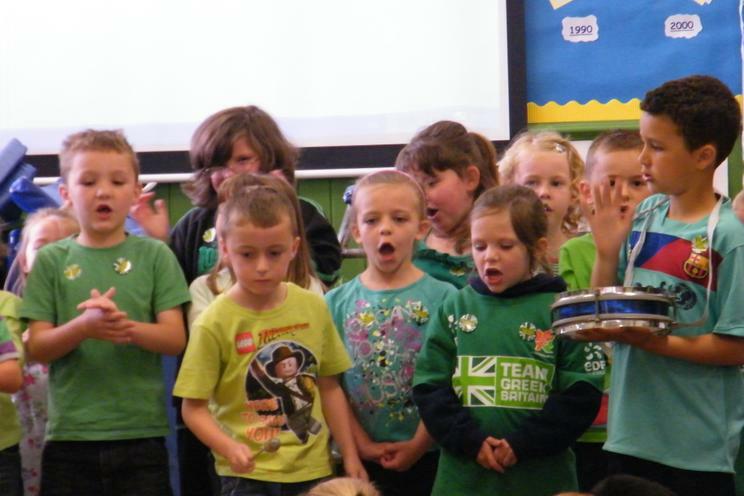 During Assembly there was some lovely environmentally themed songs and music. 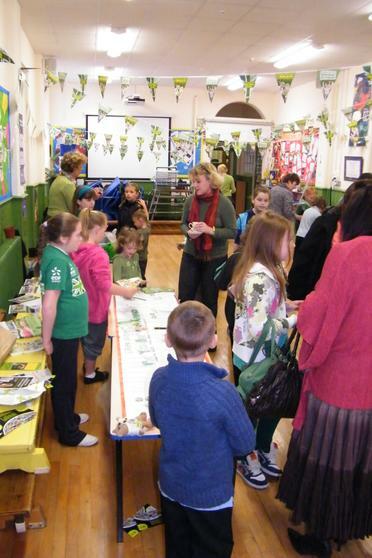 There were lots of advice leaflets and brochures on CARDIFF SUSTAINABLE TRAVEL and things like car share and bike hire. 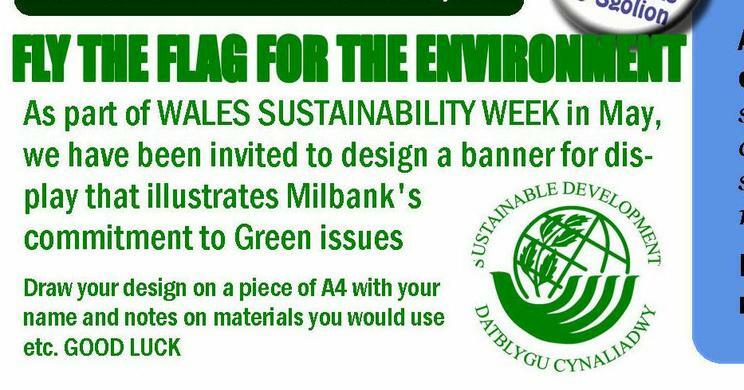 We had collected these from the Wales Sustainability week event at Chapter yesterday now that is recycling! 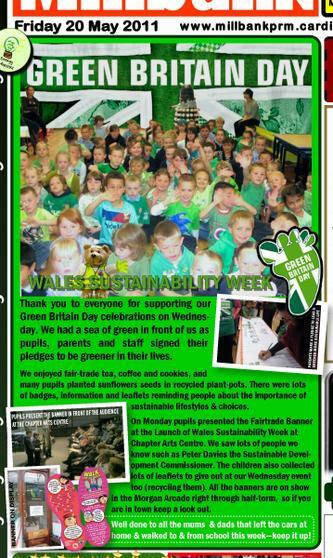 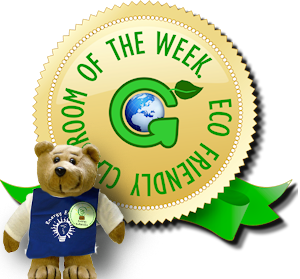 We do of course try and put something in the weekly parents newsletter, about environmental/green issues and every week we celebrate the class that has the best record in switching off lights etc. 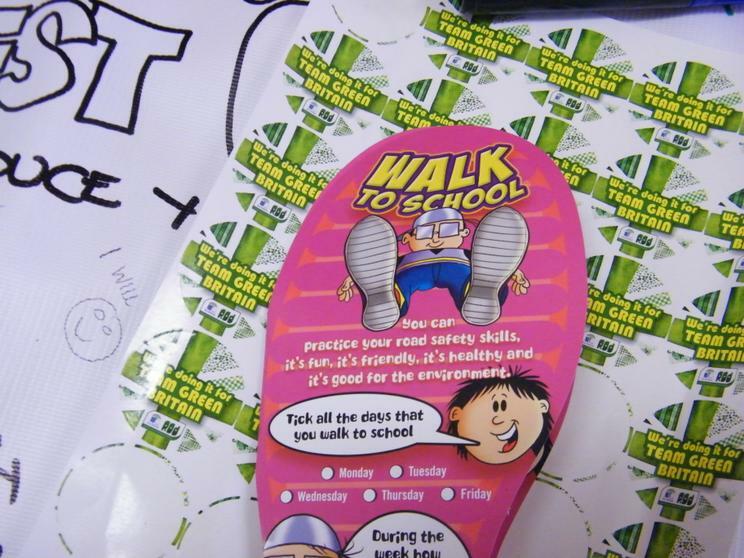 It was also Walk to School Week so well done to all the families that took part in that and made the effort toleave the car at home. 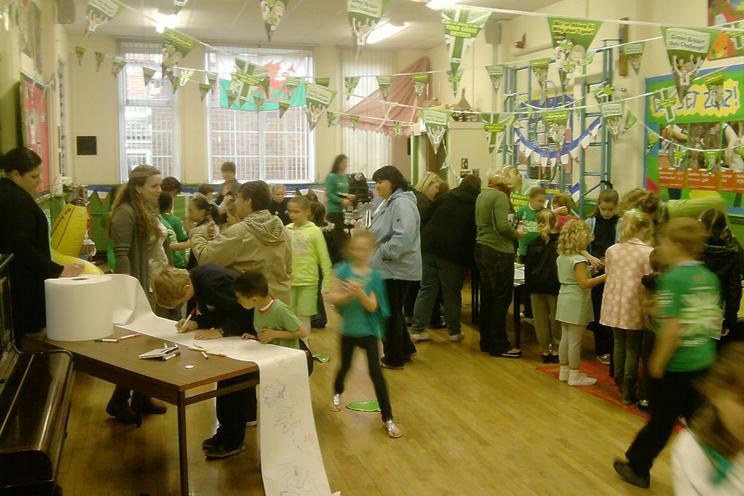 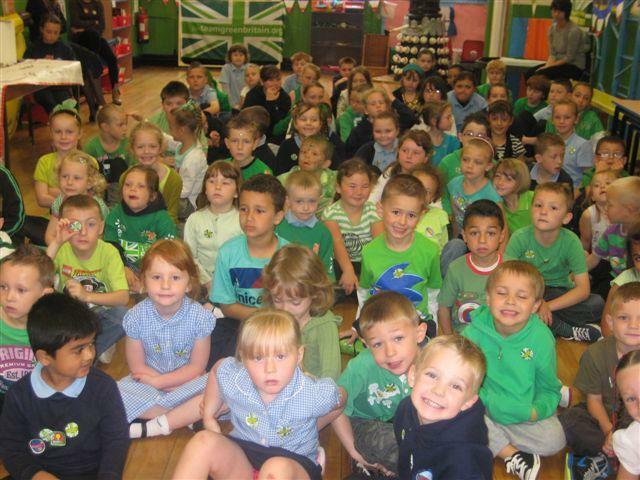 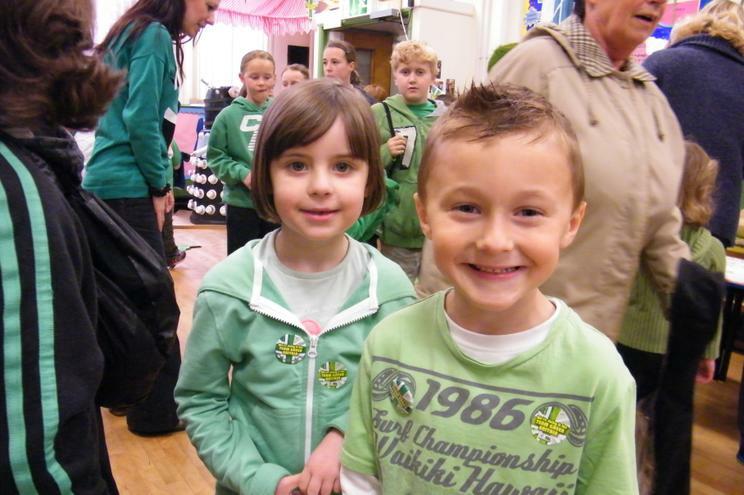 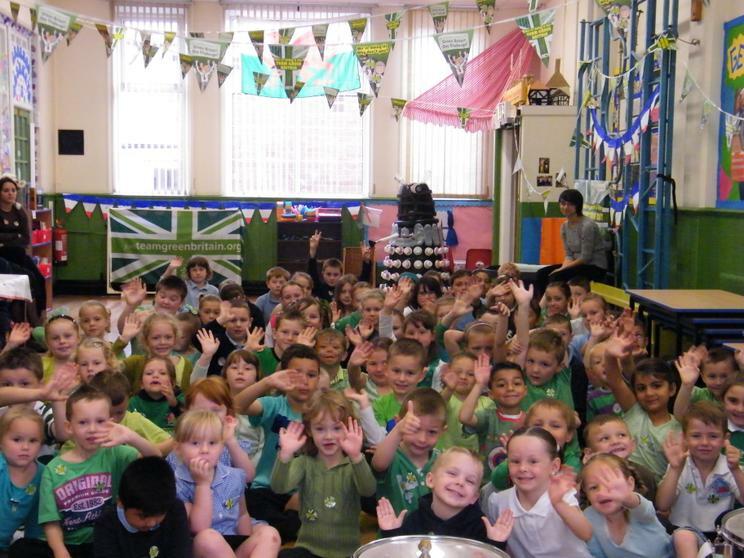 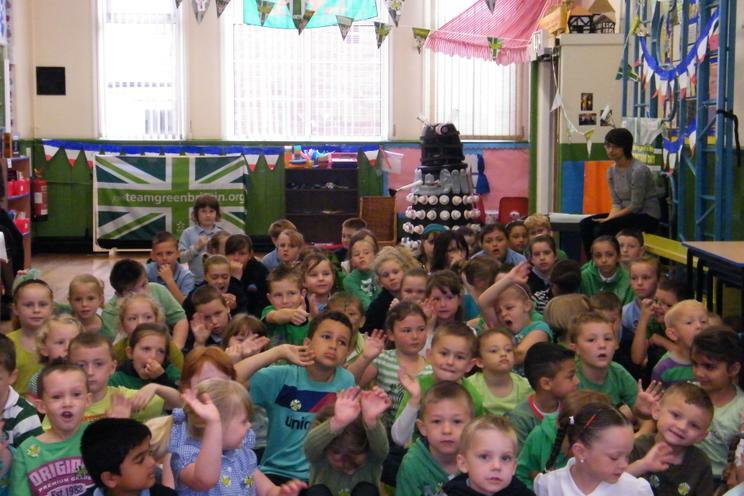 And a big Well Done to all the children in Green Gang who organised the day and came up with all the different ideas to make this another fun day.